As part of our “Go Green” initiatives, ActioNet participates in the Car Free Days, an international event celebrated every September in which people are encouraged to get around without cars and instead ride a train, bus, bicycle, carpool, vanpool, subway, or walk. 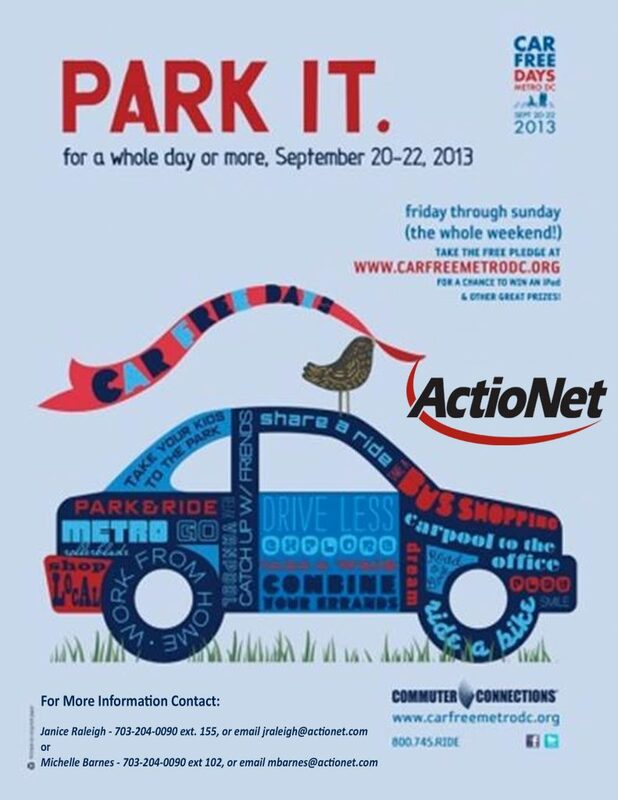 Car Free Days are open to all people in the Washington metropolitan area. Metro for bus and rail information. Washington Area Bicyclist Association, Capital Bikeshare, and Bike & Roll for bicycling. Commuter Connections for ridesharing to special events, work, and even more! Map my Walk for online printable walking maps of any city. goDCgo for getting into and around the District of Columbia. car2go and Zipcar for vehicles by the hour, including gas, maintenance, and insurance. Please contact Michelle Barnes at 703-204-0090 x102 or mbarnes@actionet.com if you would like to learn about Go Car Free or Car-Lite and make a difference by bicycling, walking, teleworking, carpooling or taking transit.